There is a wealth to Pandora that cannot be measured in dollars and cents, as has been showcased through film and attractions. 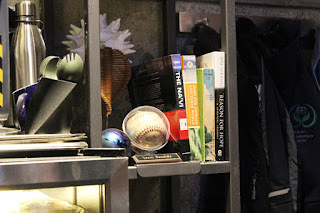 The creatures and land are so fascinating, it’s no wonder that the Pandora Conservation Initiative has shown an interest in the moon, writing books and conducting experiments that can be seen throughout the lab section of the Flight of Passage queue. While the scientific discoveries and studies are more than enough to occupy any resident of the organization, there is more to life than just work. When it comes to the residents of the Valley of Mo’ara, there is also softball. It isn’t just the scientists that get in on the sport, the folks over at Alpha Centauri Expeditions (ACE) also get in on the game. In fact, the lab’s team, known as Team Banshee, is a fierce rival with the ACE Guide’s team. Based upon some of the evidence throughout the lab, which we’ll get to momentarily, both the Pandora Conservation Initiative and ACE must have more than one team, and I’d also be willing to bet that the Pandoran Research Foundation has a team or two as well, not to mention the expats who now call Pandora home. Getting back to the lab, there are a number of notices that speak to Team Banshee’s preparations for the upcoming season. Not the least of which is the flyer affixed to the desk promoting the team’s practice. Upon closer inspection it is revealed that this is actually for the mandatory practice for anyone wishing to be on the team this season, so show up or you’ll be in the stands! The bottom line of this flyer actually speaks to another element hinted at above, and that is Team Banshee’s rivalry with the ACE Guides team. It reads, “We can beat the ACE Guides this year… If we practice!” Clearly, taking practice seriously was an issue last season. 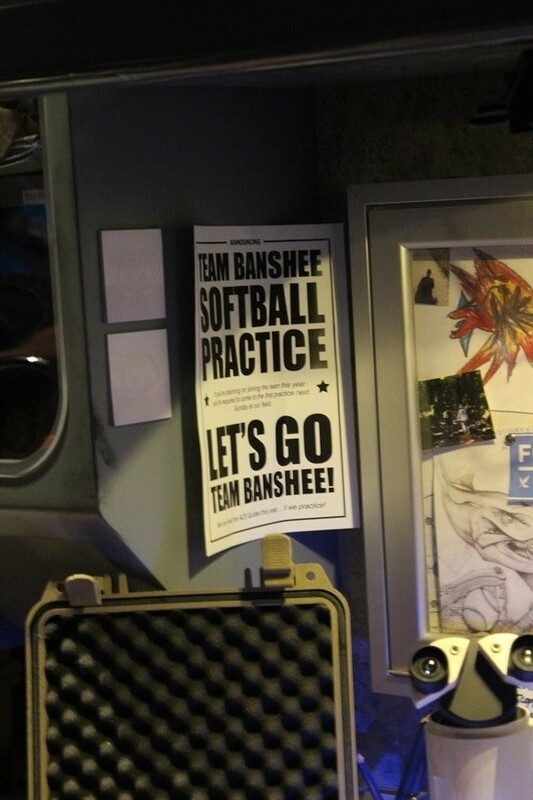 Moving over to the bulletin board at the same workstation, there are actually two pieces of information that figure into Team Banshee’s softball pedigree. The first is a sketch in the bottom left corner of the board that depicts a banshee and a softball glove with ball. The drawing is from Topher, who also happens to be the first baseman and team captain. This note has clearly been here for a while, as it is from the team captain wrapping up the previous year and speaking to preparations occurring in between seasons. It reads, “Even though we fell short to the ACE Guides this year in the semifinals, I know we can get in some work in the offseason. It was an honor serving with you all on the field.” That is some solid captaining right there. 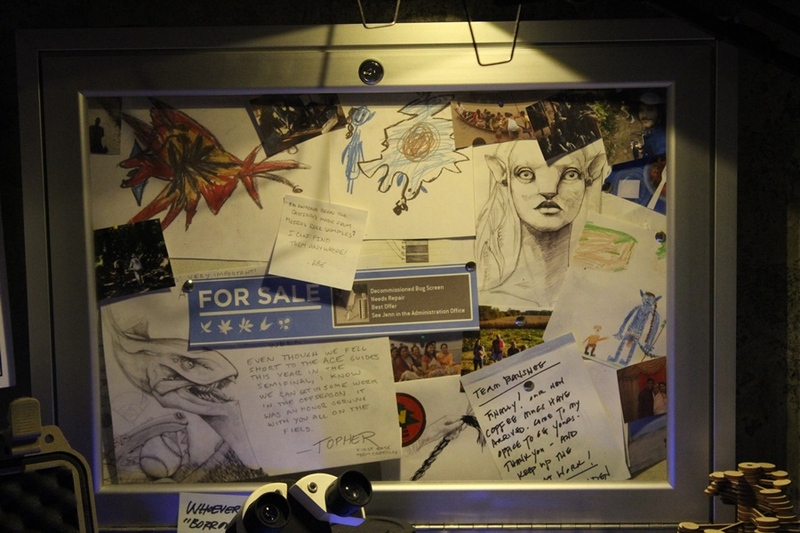 The second piece related to Team Banshee on the bulletin board comes from the lower right corner. Here we have a note from Dr. Ogden herself. The note announces, “Team Banshee – Finally! Our new mugs have arrived. Come to my office to get yours. Thank you – and keep up the great work!” Now, at first glance I’d think this is just your typical office swag, likely the Pandora Conservation Initiative mug that can be seen throughout the queue and in the gift shop, or even the mug variation seen in Dr. Ogden’s office during the briefing video later in Flight of Passage. However, considering that the note addresses Team Banshee is pretty specific, and I’d like to think that she ordered mugs to thank the team for their hustle last season, even if they did fall to the ACE Guides. 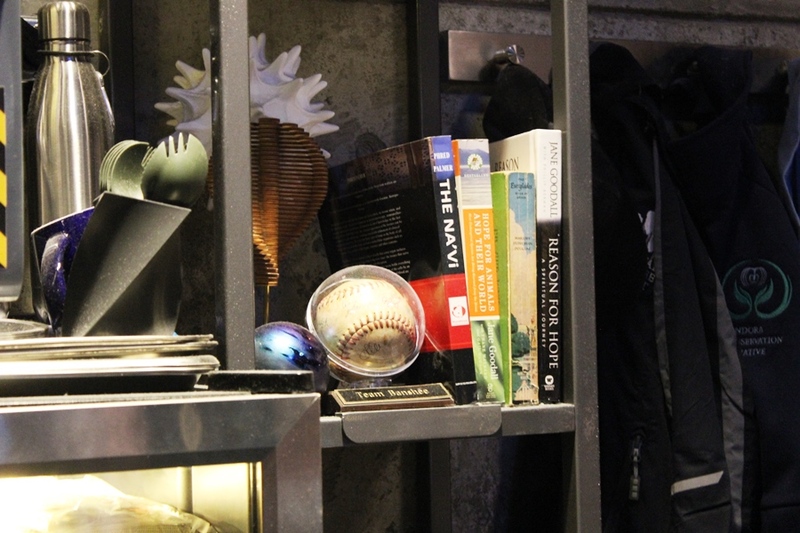 Last, but certainly not least, is the ball that is displayed on the bookshelf just before leaving the lab area. Here on a traditional wooden base is a ball with multiple signatures that has been encased and mounted. The nameplate reads Team Banshee, leading me to believe this ball is signed by the entire team to commemorate the season. Whether it is from this past season or another prior season is anyone’s guess, but win or lose Team Banshee definitely has some team spirit.